Simply stated as being the finest vintage hockey card we've sold in our 20 year history. 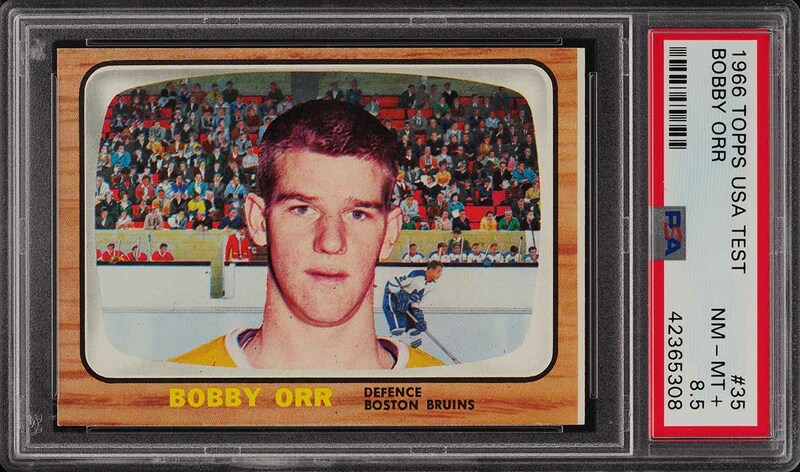 Few trading cards in our market hold the importance of the Bobby Orr, generally considered the 'Mickey Mantle' of hockey. In all truth, to our Canadian neighbors they might consider Mickey Mantle the 'Bobby Orr' of baseball. 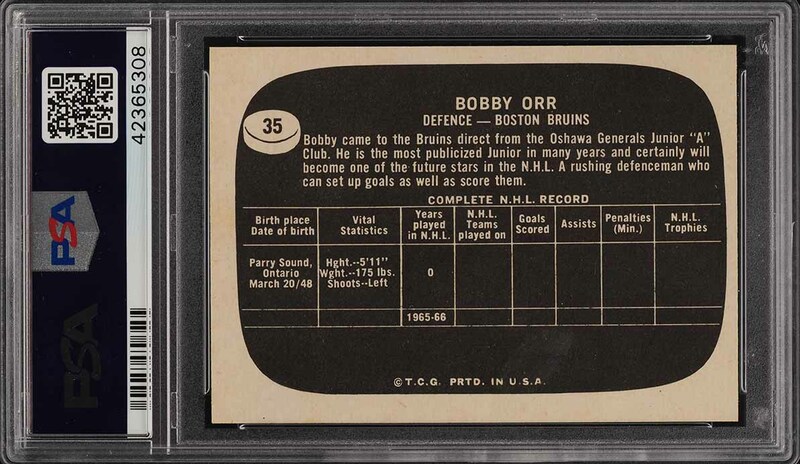 Orr's rookie Topps production is easily on the short list of must own vintage hockey productions, on par with both the 1951 Parkhurst Howe and 1979 O-Pee-Chee Gretzky as the market's elite top-tier investment pieces. The offered museum caliber Orr comes from the highly scarce 'USA Test' production issued by Topps during the same year as their standard issue. While similar to the standard issue, the USA Test production was issued only in the US and printed in far fewer quantities. Limited to only 66 cards (half the size of the standard issue) and also carries other production variances included a tell-tale white stripe to the front border, somewhat lighter-grained wood borders, and an all-English reverse (standard issue included both English and French). This example has just returned from PSA having survived their ever increasingly strict standards to emerge with an assessment of NM-MT+, making it one of the very finest known examples in the world. 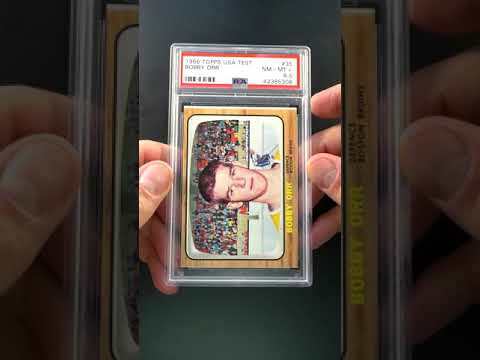 Just one PSA 9 has ever graded higher and that copy sold at public auction early this year for over $200,000. Bright, fresh, and wonderfully preserved throughout; we are absolutely delighted to feature this world class investment piece and offer it to the market free of reserve or any other restriction. A truly special offering which sets a tone rarely seen on the investment market. Not to be missed and comes with our highest recommendation. One of nearly 15,000 cards, lots, and sets up for bid in our 4th Auction of 2019. Click on the link above to view the other PWCC auction lots. The PWCC Vault is now live! Open a PWCC Vault account and receive a custom Vault shipping address. Purchases shipped to the Vault receive free shipping and reflect Oregon's 0% sales tax rate.